At $7,799, Could You Picture Yourself In This Sweet 1993 Toyota Pickup? 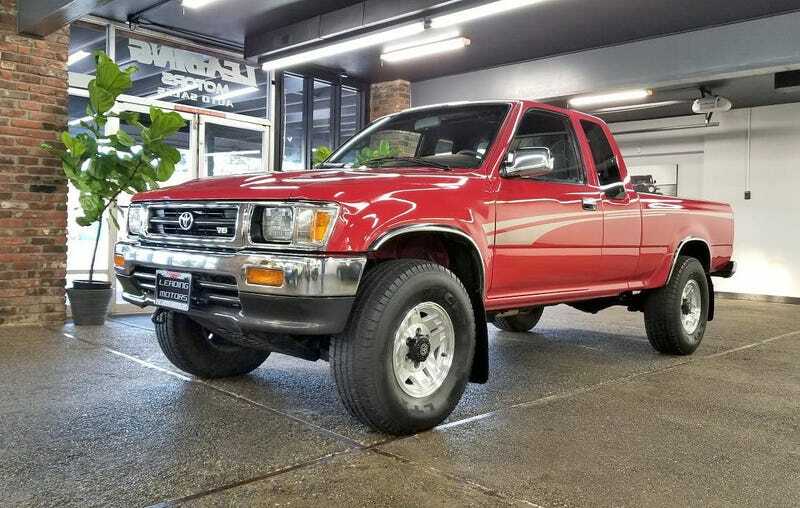 Look at today’s Nice Price or Crack Pipe Toyota truck and then look at both its age and its mileage. Yeah, something just doesn’t add up. We’re going to find out if that something, is its price. At first glance, yesterday’s 2004 VW R32 was somewhat of a puzzlement. The car was claimed to have ‘a clean blue Texas title,’ which should be taken to mean it’s never been junked and rebuilt. That however, was called into question initially by the weird choices of endowing the nose with a later bumper cap, and switching the R32 seats for lesser chairs. The final blow came by way of Jalop deluxe, As Du Volant, who went to the trouble of grabbing the CarFax report on the car. That damning document showed two accidents including a troubling ‘disabling damage’ event in 2011. As you might expect, all that adds up to something, but not to an $8,750 price. If you haven’t already guessed, that dunned the car to a 63-percent Crack Pipe loss. Arrr! In Oscar Wilde’s only novel, The Picture of Dorian Gray, the title protagonist sells his élan vital so that his portrait might age while he does not. That’s pretty trippy stuff, and guessing by the seeming agelessness of actors like Keanu Reeves, Gabrielle Union, Jered Leto, and Marisa Tomei, I’d guess that this soul-selling business is continuing to boom today. You could easily add this 1993 Toyota Deluxe Cab V6 4WD Pickup to that list of immortals. Toyota trucks, especially those of the ‘80s and ‘90s, maintain an enviable reputation for longevity, as even the buffoons from Top Gear failed to dispatch theirs, not for want of effort. These trucks are just able to roll with whatever abuse you can dole out. Still, they don’t have to look this nice doing it! The truck is red on grey, which handily recalls both Wilde’s main vain (see what I did there?) character, and the blood pact that was made made to stop his biological clock. I think the similarities end there however, as there’s no evidence of there being a Polaroid of the truck, in which it’s sitting in a wrecking yard, spent and consumed. There might be though, and that would explain how, after 25 years and 194,000 miles, this extended cab pickup looks so freaking good both inside and out. What, were those mile racked up while in some sort of protective bubble? How else could you explain this truck’s pristine presentation? Walk around it and you find that the paint seems to shine like the day it was built, and the factory stripes still decorate its flanks. Original factory wheels show no sign of curbing, nor do the bumpers evidence any bumping. Geez, I didn’t look this good at 25. The only sign of age on the truck at all in fact, is some wearing of the 4WD logos on the back mud flaps. Those are handy since the truck is a 4X4. Along with the 4WD, this truck sports a 150-horse/180 lb ft of torque 3VZ-E V6. That 3-litre is the only SOHC V6 Toyota has ever offered, and here it’s mated to a four-speed automatic. The seller says that the truck has been inspected and been given a clean bill of health. That offering dealer also claims that the truck was meticulously maintained by its elderly former owner. That ownership record goes a long way in explaining the truck’s seemingly miraculous condition. Oldsters do tend to treat their cars in one of two ways. Either they give them with the utmost of care since, ‘who has the money to buy a new one at today’s prices?’ Alternatively, they use them as mammoth curb feelers, scraping by every pole and parked car, not caring the outcome. Thankfully this Toyota appears to hail from the former category, and that makes it pretty special. The price is $7,799, and it’s now your duty to decide whether that seems fair or not. What do you think, is this amazingly clean Toyota worth that $7,799 asking? Or, is that price a deal with the devil? H/T to Bernie for the hookup! At $8,750, Could This 2004 VW R32 Be Your Golf With Balls?